Really. Where are all the aliens? We should have been probed, exterminated, assimilated, infected, invaded or abducted by now, shouldn’t we? The Fermi Paradox ponders the lack of evidence of another transmitting intelligent civilization — of all the stars and all the galaxies in the universe, you’d think one intelligent alien race would have bothered to call by now? Either we’re on the interstellar “do not call” list, or we’re the most advanced life form out here (scary thought), or (even scarier) we’re the only life form out here. One phase of development we assume is that an intelligent race of aliens will have worked out how to transmit radio waves. We’ve been “radio loud” for nearly 120 years (although, with the advent of digital, our easily detectable analog signal will soon go silent) — so should any eavesdropping aliens be within 120 light-years from Earth, they may have detected us. But that’s just accidental radio leakage — what if we could turn our radio antennae to the stars and “listen” for ET’s deliberate attempt to send a radio signal? 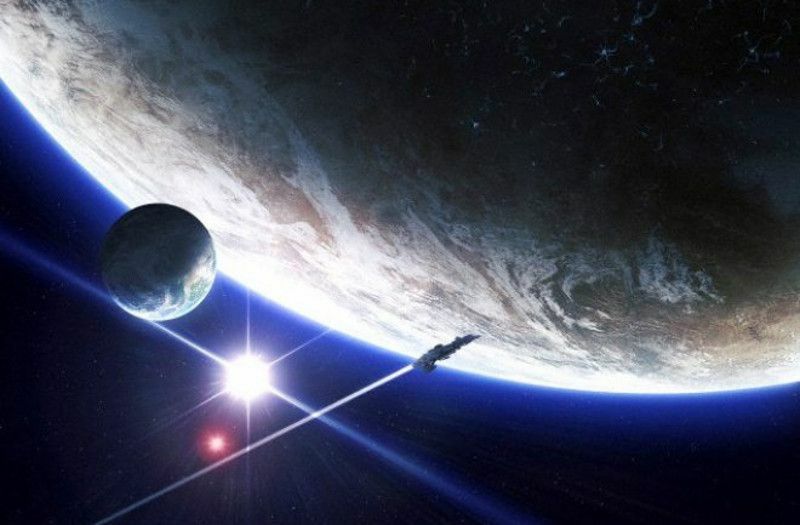 Since the 1960’s SETI programs have hunted for alien radio signals, but only recently, with the help of NASA’s Kepler space telescope, have we been able to carry out directed searches on star systems that are known to contain exoplanets that could play host to an alien civilization. Although this directed SETI hasn’t turned up a signal yet, there’s potentially millions more “habitable” worlds out there — we’ve only just begun. There have been a few false alarms when listening out for a SETI signal. As we’re looking for a specific, narrow-band radio signal (something that could only be generated by a form of technology), terrestrial interference can show up in SETI searches. Fortunately, astronomers are a savvy bunch and usually know the difference between aliens and Aunt Sally gossiping on her cellphone. Alien Footprints… on the Moon? Whoa! Hold on just a minute! I thought we were looking for aliens living around other stars, not taking joyrides on the moon! This is true — though mainstream SETI searches focus on looking for suspect radio signals in deep space, it’s worth keeping in mind that the moon is a pretty good rest-stop for any visiting aliens to the Earth-moon system. Looking for the equivalent of alien footprints on the lunar surface isn’t so silly when considering NASA’s Lunar Reconnaissance Orbiter — that’s currently in moon orbit — can pick out Neil Armstrong’s bootprints from 1969. Why stop at the moon? If an advanced alien species has cruised through the solar system at some point in our sun’s history, perhaps they left some artifacts littered about the solar system. Forget “habitable exoplanets” for now — how about directing a search at stars that are similar in temperature, size and chemical composition to our sun? The sun, after all, provides our planet with energy, and all the chemicals that form our planet came from the protoplanetary disk surrounding our newborn star 4.5 billion years ago… why not just look for sun-like stars? Well, in 2012, astronomers discovered HP 56948 — the sun’s “clone” only 200 light-years away. Although no exoplanets have been discovered in orbit so far, it’s interesting to ponder whether to target “Earth-like” planets or “sun-like” stars as potentially habitable places for alien civilizations. From Kepler’s vantage point, as it observes the slight “dip” of light it receives from a star as an accompanying world passes in front (or “transits”), the space telescope can analyze the “light curve” it records. Although planets are, you know, circular, there may be a surprise if the light curve reveals that an irregular shape has just passed in front of a star. Irregular planetary shapes do not exist in nature, so if Kepler detected anything other than a circle — a massive pyramid, perhaps — that could be evidence of alien shenanigans. Interestingly, there’s a term for finding aliens in this way — it’s known as the search for extraterrestrial technology (or SETT) and it differs from SETI as we’re looking for indirect evidence of an advanced technology in the cosmos. In 1964, Soviet astronomer Nikolai Kardashev hypothesized that some alien civilizations may become so advanced that they utilize all the energy coming from a star. Such extraterrestrial civilizations are known as “Type II” on the Kardashev scale. How can they do this? Well, by creating the sci-fi favorite Dyson Sphere around a star. This shell would collect all the energy from the star, thus hiding it to any outside observer. From our perspective, if we saw a lack of star light in dark pockets in nearby galaxies, perhaps that’s due to these types of civilizations constructing huge spheres around stars. The word on the street is that mankind is on the verge of becoming an asteroid-mining powerhouse… although the reality is that the majority of the technology we have currently cannot mine and refine ore in space. But that doesn’t mean distant extraterrestrial civilizations haven’t advanced to this stage. We know that asteroids contain a wealth of material and we know that asteroids orbit other stars — therefore, ET will likely jump to the same conclusion as us: mine asteroids for material and get rich! (Well, the “get rich” thing might be more of a human disposition.) Could the debris from wholesale alien mining operations around another star be detected? Possibly. If sufficiently advanced, some aliens may even fabricate their own tiny black holes, measuring only an atom’s width and yet carrying the mass of a million tons. By plopping this black hole into some kind of hypothetical black hole drive, the engine could generate a vast quantity of gamma-rays that, in turn, would be converted into energy to power the spacecraft. According to researchers, this could be an inexhaustible power source. What’s more, if we know the signature of the radiation emitted from these artificial black hole drives, we may be able to detect these whizzy aliens. The problem with SETI searches is that we have to make a lot of assumptions. One assumption is that the aliens are transmitting in radio waves (what about laser transmissions?). Another is that the aliens are always transmitting. This, sadly, wouldn’t be the case (unless a very charitable civilization switched on a 24/7 beacon for billions of years). Dolphins are intelligent — possibly as intelligent as humans. But they aren’t known for their ham radio operator skills. What if intelligent aliens are more like dolphins? Are we destined to never detect them, unless we go to their homeworld and communicate with them face-to-face? This discussion has not only motivated SETI debates, it has also forced us to reassess what “intelligence” really means on a galactic scale. As the universe seems so quiet, some astronomers have — prematurely — declared that no other intelligent life exists amongst the stars. From a science point of view, that’s as good a conclusion as any, even if it is a bit short-sighted. But what if it’s so quiet as alien civilizations don’t want to make contact? What if they are happy doing their thing, not wanting to speak with us? Also, what if they’ve become so efficient, they leak very little energy into space for us to detect? As movies like Battle: Los Angeles and Independence Day have taught us, we’re just a heartbeat away from an alien invasion. This has led many great thinkers to ponder the question: Why would they invade? My personal response has always been “why not!” — the reasons for an invasion would likely be unfathomable. But this does make for an interesting thought — could an alien invasion be considered a viable SETI strategy? I’ve always been a fan of waiting for extraterrestrials to arrive, as the wonderfully patient Waiting for Extraterrestrial Intelligence (WETI) Institute suggests. In the meantime, perhaps we should just keep our heads down and hope that no one notices we’re here.